First of all, I want to apologize for the lack of recent posts. I still have several stories to share about West Trip 2007 and those will come, hopefully soon. School is a terrible thing, keeping the diligent tied down with never ending homework. Fortunately, this past weekend I had a respite. With virtually no homework due on Monday, I was able to take a last minute trip to the Smokies. I haven't done a solo trip to the park in far too long so it was great to be back out camping and doing some intense day trips to sample remote fishing opportunities. I headed out of Chattanooga around 2:00 on Friday afternoon and made it to Little River Outfitters in Townsend by around 4:00. After finding a few fly tying items I needed, I talked to Daniel about a stream he had fished that I've been eying for awhile. Then he asked me if I had fished one of the Superfine Trout Bum rods yet. "Not yet," was my reply to which he asked if I would like to for the weekend. Opportunity doesn't come knocking like that every day and I saw a great chance to do a product review. After he got the rod and I purchased my items, I headed towards Elkmont to set up camp. I just had to go fishing so as soon as my tent was up, I quickly put the Trout Bum rod (8' 4wt, 4-piece) together and started fishing up through the campground. The water was terribly low but the fish were still cooperative. A couple nice browns and one small rainbow later, I headed back to camp to get something to eat. After that I hit the sack since I was thinking about a big trip the next day. The next day, after a huge breakfast, I headed over the hill to the North Carolina side to hike into a stream that I've been wanting to hit for awhile. The hike was fairly intense, made especially so by the fact that I'm not in quite the shape I should be (that will be remedied by the time my October trip rolls around). In hand I carried the Trout Bum rod to continue testing it out. After my first evening of fishing with it, I was already trying to dream up a plausible story that I could tell Daniel as to why I couldn't return the rod. When I reached the stream, I was dismayed to find two fisherman coming downstream from where I intended to fish. After asking them how far they had fished, I decided to just start there and see what would happen. Despite the recent pressure, I was still able to fool plenty of fish. All the fish caught were brookies except for one lonely rainbow, a good sign I thought. The stream was very good-sized, especially for its elevation and was full of eager fish. Dry flies were the best option with an orange Neversink caddis accounting for most of my fish. I had forgot to bring my headlamp this weekend so after fishing a couple of hours, I headed back down the stream to make the jaunt up and over the mountain. Getting stuck in the backcountry all night is not my idea of fun. 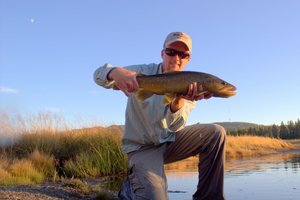 After getting back to camp, I went down to a large pool on Little River to further test the rod. I had already used it to effectively fish dries and also heavily weighted nymphs so I decided to toss some streamers for awhile. I never threw them more than 30-40 feet for lack of casting room but the Trout Bum rod easily handled a weighted #4 Simi Seal Streamer. After pounding the water awhile, I headed back to camp and got to bed early again. Sunday morning I wanted to fish the Little River above Elkmont. Accordingly, I got up, ate a quick breakfast and after taking down camp, I started up the trail. I decided to just start fishing without hiking very far but soon saw the telltale wet bootprints. I still managed a few fish before getting out to hike a bit farther. This time I thought I was fishing fresh water but after fishing for probably an hour or more, I saw to guys fishing above me. I had still been catching some fish but realized it probably should have been much better if I hadn't of been behind other fisherman all day. Still, despite fishing behind somebody I managed probably 10-15 fish over 2-3 hours so it wasn't a horrible day. Our most recent poll asked you which season was your favorite for fishing. Surprisingly, the majority of voters picked fall. Now I'll admit, fall is my personal favorite but every time I see this discussion come up, most people would vote for spring with its consistent hatches and the first reliable action after the cold winter months. When I first picked the topic for this poll, I fully expected to see spring come through as the winner. Past experience on the water tells me that more people are fishing in the spring than in the fall. After a lot of thought, I decided the issue might revolve around the complexities of the human mind. I know I have at least a marginal tendency towards the following: the best season for fishing is whichever one is right around the corner. Thus it makes sense that everyone is excited about fishing in the fall. I distinctly remember this subject appearing on several forums such as the LRO Board last spring. More properly, I should say early last spring when the first hatches were just about to take off. Everyone had been stuck inside all winter (at least the lazy folk...) and most people were sure that spring was the best time to fish. 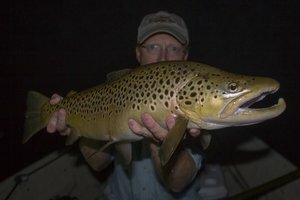 Now that we have a secondary "peak" in productive fishing coming up, people are turning their thoughts and minds towards the opportunities of fall such as large aggressive brown trout. 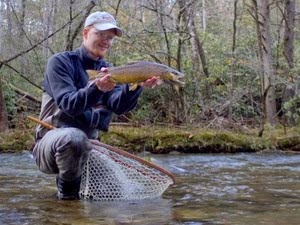 Indeed, some of my best browns caught in the Smokies were taken in the September-November time frame. Of course, it is also entirely possible that the majority of people that took the time to vote really do think fall is the best time of year for fishing. Regardless, it appears that a lot of fisherman are looking forward to the fall season. 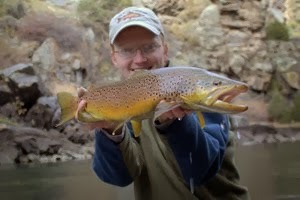 Here is another great blog about fly fishing in East Tennessee. It is called The Trout Addiction and comes from Brett Romer in Maryville, just outside the GSMNP. Of course, we are jealous because his location is much more central to great fishing than ours, but hopefully we'll pick up some hot tips from his posts on some of the finest that East Tennessee has to offer. Crazy timing, a developing hatred of whitefish, and unreal brookie fishing all made up day three of our Yellowstone adventure. The previous day we decided that a trip over to West Yellowstone and Blue Ribbon Flies was in order. In the process, we hoped to check out the Gallatin River. We got a reasonably early start and headed west without too many delays. Anyone that has been to Yellowstone knows that what looks to be an hour or two long drive can easily be twice that with all the traffic jams where the tourists gawk at a buffalo that decided to park on a nice piece of pasture immediately adjacent to the highway. Thankfully, we didn't run into that situation much on our way and were soon in West Yellowstone at Blue Ribbon Flies. We went into the shop and were immediately in heaven. This shop has the best large selection of traditional tying materials I've probably ever seen. The selection of hair and feathers was astounding not to mention their patented Zelon. After browsing for altogether too long, I finally decided it was time to get out before I saw all my money depart my wallet. I made my way up to the counter to pay where a gentleman with a slight southern accent was conversing with the guy at the register. Standing there listening and waiting my turn, I started to realize that this guy looked familiar and then he mentioned something about "back home in Tennessee." In amazement I asked, "Are you Hugh Hartsell?" We had known that Mr. Hartsell would be out there but hadn't expected to see this excellent guide from Tennessee. After all, it is a huge area out there and the chances of running into him were extremely small. Incredibly, he answered in the affirmative so we had the pleasure of spending several minutes chatting with him about the fishing he had been doing in the area. He informed us that the Gallatin was off color which was a bummer since we were planning on fishing there. He also mentioned that he thought the Gallatin was the best option for good fishing in the area based on his experience so far. Still in shock over the unbelievable timing it took for us both to be at BRF at the same time, we eventually said goodbye as his wife was waiting on him. After finishing up at Blue Ribbon Flies, we decided to head up to the Gallatin anyway. It turned out to be a good decision. We got there and while the water was cloudy, it was still fishable as long as you could cast in the increasingly gusty wind. I started out fishing hoppers figuring that surely the strong wind would be blowing them into the water but I couldn't rise a single fish. Soon after, I switched to a Tellico nymph and things improved drastically. 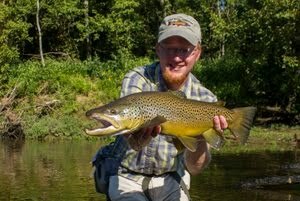 After landing that beast, I soon caught several more rainbows and cutthroat before finally landing one brown. Four species in a couple of hours from one stream was pretty amazing but it was time to move on. The wind had got even worse and we had other streams we wanted to look at. After stopping to check a few spots, we finally settled on the upper Gibbon where I had fond memories of casting to brook trout in a beautiful meadow setting. It was just as I remembered and we were soon catching brookies and the odd rainbow on small ant patterns. They came in two sizes mainly, small and smaller. However they were very willing to eat and provided nonstop fun on dries which is a good time any day in my book. I even caught one guy that had some serious "teeth." Day two in Yellowstone was dedicated to Soda Butte Creek. The afternoon closure necessitated fishing earlier in the day and we were on the stream by around 11:00. We fished in the vicinity of Soda Butte and did well, mainly on terrestrials. Things started out a bit slow for me as I was learning where the Cutts liked to feed and hold but once I figured out where they were, things became easy. It wasn't until just a little while before the closure that I discovered a deadly technique to take some nicer fish. It was really quite easy but provided a lot of fun and entertainment. I positioned myself somewhere around the head of a pool where the riffle from above dropped off the ledge into the deeper waters of the pool. The best spot was where there was an eddy at the head of the pool. The fish would just stack up in there. The slightly off color water of Soda Butte Creek is really what made this technique work. After I had positioned myself, I would cast my fly just a short distance, never more than 10 feet or so. The goal was to have all my line off the water with just the fly touching. Once I got the fly (foam hopper) on a good drift, I would start tapping my rod vigorously enough to twitch the fly as it drifted through the whirlpool. The fish absolutely went nuts. This technique accounted for my best fish which probably was around 15 or 16 inches. Unfortunately, the closure went into effect soon after I figured out this method so we had to move elsewhere. After a quick lunch, we decided on fishing upper Soda Butte Creek above Icebox Canyon. This proved to be an excellent choice and we caught several more fish with most in the 6-10 inch range but a few nice 12-14 inch fish were mixed in as well. The best fly here was hard to determine. It seemed that once you caught a fish or two on one fly, it would no longer be effective. This kept me changing flies quite frequently. Another interesting phenomena we discovered here was that the fish were very hard to spook. Often, the fish would not hit on the first, second, third or even fourth drift. Sometimes it took 15 or 20 casts before a fish would rise. This was strange since I'm used to the willing fish of the Smokies where it is generally agreed upon that you give each spot a few casts and move on. Just as promised, I have taken time away from toiling over a textbook to bring you more on West Trip 2007. While I still have a post or two about Colorado, it is time to focus on Yellowstone for awhile. We arrived in the park on August 6, 2007 and made our way to the Northeast corner to find a camp. We decided on Pebble Creek which turned out to be an excellent decision. After setting up camp and being lazy for awhile, it was time to catch that first Yellowstone trout of the trip. Being 100 feet from Pebble Creek made the decision easy (and the fact that the afternoon closures on the larger streams was in effect). It didn't take long to get that first Yellowstone Cutt and several others, most being 5-6 inches. After being spoiled by all the hogs in Colorado, we wanted something at least a bit larger so we wandered up the road towards the upper portion of Soda Butte above Icebox Canyon where the closure was not in effect. We soon found a few fish that were a bit more respectable before wandering back towards camp to make some supper. After eating, we just had to go find some pigs so we went to Trout Lake. Everything I had read about this lake indicated the fish were generally of good size. Upon arrival, we found the lake to have a bit of chop on the surface making spotting fish difficult. However, after awhile it calmed down and we were spotting some monsters. Some fairly large speckled cream midges were coming off but I had nothing in my box to match. I knew that the fish were probably taking midges under the surface though so I tied on a zebra midge and was soon sight casting over a nice Cutthroat. Many casts later, the fish ate solidly. Surprisingly, I had already got this fish to eat twice but had not stung it yet. The gorgeous fish soon came to hand and posed for a brief picture before it swam away.